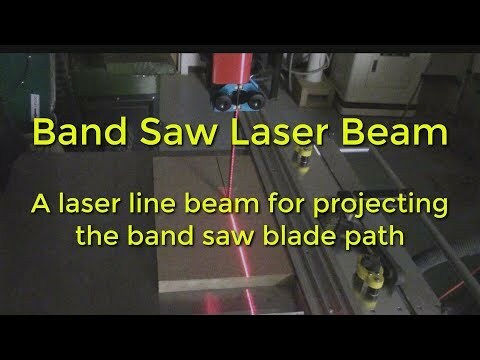 Projects a laser line to represent the path of the band saw blade. The Accu-Path Band Saw Laser is designed to attach to the band saw to project a laser line for the path of the blade through the wood you are cutting. This way you know exactly where your blade will cut. This makes for accurate cutting especially when using the Accu-Wedge and Accu-Slot accessories for the Accu-Slice System. It also makes for safer operation of your band saw because you know exactly where you are cutting. The laser is attached to the top cover of your band saw. It has a slot in the mounting plate to enable the adjustment left to right. In addition, the laser can be adjusted by rotating it in the mount and then fastening it in place with the set screw. The laser comes complete with the 650 nm, 5 mw red line laser, the offset aluminum mounting bracket with 2 magnets and screws, and the battery case with an On/Off switch. The battery case requires two AA batteries which are not included.